Firefighters from Mason, with mutal aid from New Haven, battled a fully-engulfed mobile home fire Thursday morning. The Mason Police Department is investigating the fire as arson. 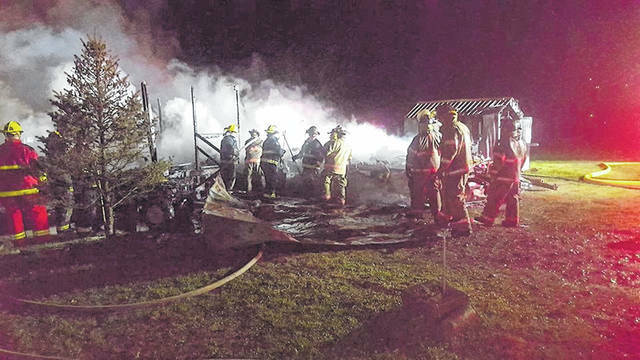 MASON — An early morning fire that destroyed a mobile home has resulted in investigations by the office of the West Virginia State Fire Marshal and the Mason Police Department. According to information from the Mason Volunteer Fire Department, personnel were called to a trailer file on William Lane at 3:20 a.m. on Thursday. Upon arrival, the trailer was fully engulfed. No one was home at the time of the fire as confirmed by R.C. Faulk with the Mason Fire Department who said the unoccupied trailer was a total loss, as was a nearby outbuilding. Reportedly, there were no injuries and no damage to nearby homes. Mason Police Chief Colton McKinney said, though the fire marshal’s office has yet to determine an official cause of the blaze, the police department was investigating it as an arson. McKinney said there are arleady leads on a possible suspect in the case. He added there was no report yet from the fire marshal’s office which was notified of the fire Thursday but his department would be working “side by side” with fire investigators. McKinney confirmed the trailer is owned by Brenda Lee McCarty, 56, of Mason. As previously reported, McCarty was arrested on a felony possession with the intent to deliver charge earlier this month. An additional five people were also arrested along with McCarty. Those five people were charged with conspiracy to commit a felony, as previously reported. Magistrate Gail Roush set McCarty’s bond at $50,000, with home confinement if bail is posted. As of Thursday evening, McCarty was still listed as being incarcerated at the Western Regional Jail. There were 13 members from the Mason Fire Department who responded to the fire with mutual aid provided by the New Haven Fire Department. Firefighters fought the fire for around 50 minutes. Mason County EMS was also on the scene. This call was approximately 800 feet down the street from the fire station in Mason, according to information from the Mason Fire Department’s Facebook Page.